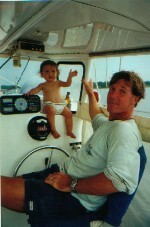 What would you do if you had a four year old or a fourteen year old on your boat for a month, or even just one day? There are many things that kids can do while on board to stay occupied, have fun and even learn something new. However, sometimes adults have to get creative in finding neat things for kids to do, and that is not always easy. Here are some ideas, resources and guidelines to follow when planning a day or a few days on the water with children. For children of all ages it is a good idea to keep an “art box” with crayons, colored pencils and markers and a ream of white paper to color and write on. We use a small Rubbermaid-type box with a lid and a handle. Markers are good for older children, but a potential disaster on setee covers, headliners and teak varnish if used by toddlers. Kids love art projects and can spend hours working on them. However, with the motion of a boat underway, or even at a dock, messy art supplies like glitter, glue, paint and inks are not good choices. Kids should be able to work with minimal supervision, and these items require much more attention and adult supervision. After all, the main objectives are to keep them occupied, safe, and happy. 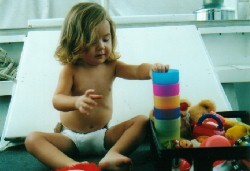 Young children, such as toddlers can get bored easily, especially when they are on a boat and are not allowed to touch many things. Using the boat theme to plan activities for them works well because then they can be involved on their own level. A toy boat is good for playing in the cockpit and below decks, and a pair of junior binoculars can entertain them in the cockpit and on deck. A boat related coloring book, or a board book with fish and marine wildlife are great also. Encourage children’s parents to bring the child’s own books and toys in a container that can be used to store them and so they won’t get lost or clutter up the salon or cockpit. 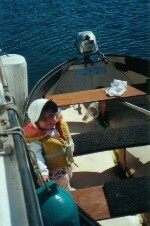 For older children, ages 4 and up, there are many activities that they can do which involve the boat itself. There are many skills that can be learned while on a boat and kids will hardly realize they are learning. For example, one of the best ways to get a child involved and confident about boating is to let them sit at the helm and feel what its like to steer the boat, under your supervision of course. Two minutes of this activity boosts their confidence and makes them feel privileged. Get some free paper charts of your area, one for each child so there is no fighting, at any marina or marine store. If there are none available in your area, the folks at US Charts (www.uscharts.com) will mail some to you. These charts are a great way for kids to become involved with the activities of the boat, learn navigation, and not get bored. Kids can plot their course out of a channel by matching up the markers with the symbols on the chart. They can spot and record landmarks on their chart, as well as manatee sightings, dolphin sightings, bridges, tow boats, and almost anything else they see out on the water. You can show them the coordinates on a GPS and how to plot them on a chart. They can create their own legends, as well as learn the cardinal points (east, west, north and south). If the kids do not understand very well, get frustrated, or lose interest, just remember that the objective is to involve them and to give them an idea of what navigating a boat is like. Other fun aspects of boating that children like are flags and burgees. Kids can make their own flags out of white paper and crayons or markers. Explain to them what the signal flags are and the alphabet code that they represent. They can make their own messages and spell their name in flags. Also, if kids are on an extended cruise, they can make a Kids On Board flag to alert other children in other boats. If you are taking a trip to the Bahamas or another country, take along a white sheet and some scissors and make courtesy flags with markers. Kids of all ages love watching their flags fly from the boat while underway. Show kids what the different gauges on a boat are for, from the depth sounder to the anemometer. Children like computers and high tech gadgets, and they can help you keep an eye on the depth or the direction of the wind. Fishfinders are also exciting for children, especially if they have graphics and colors. The child doesn’t have to touch it to see what it does, and permission to do so should be granted by the captain. On our boat, our two and a half year old daughter Sunny is not allowed to touch anything electronic. You can arrange for kids to play games like scavenger hunt, where they have to find different things on the boat, or identify different landmarks. They can draw a picture of a boat and label the parts as well. Cards and board games are good also for playing in the salon, but not recommended on deck or in the cockpit because pieces can fall over board and cards can fly away. There are a few good resources to help you occupy children while on board. 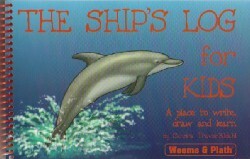 Weems and Plath publishes some excellent children’s activities books and CD-Roms, such as The Ship’s Log for Kids, by Sandra Travis-Bildahl (Weems and Plath, Inc. www.weems-plath.com, ISBN 1-878797-15-8). This spiral bound book is designed for children to record their adventures while at sea. It is great for a daysail or an extended cruise, and teaches children about weather, stars, morse code, sea life and more, as well as observing and recording what’s around them while on a boat. Another excellent activity book is The Boat Book of Fun also by Travis-Bildahl, (Weems and Plath, Inc. www.weems-plath.com, ISBN 1-878797-16-6) and also published by Weems and Plath. This book has art projects, word searches, puzzles, science experiments, games, and lots of places for children to write, doodle, draw and create. Both books have laminated covers. 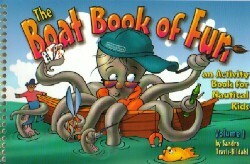 Another activity book designed for the long term boating child, but which can be used by the daysailor, is Fun Afloat! by Theresa Fort (FortWorks Publishing, 2001, 170 pp). If you have a computer onboard that the kids can use, Weems and Plath also publishes Capt. 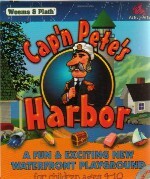 Pete’s Harbor (Active Arts Software), which is a print art program for ages 4 – 10 with tons of activities centered around watersports and boating. Kids can “play mind bending puzzles and memory games” and make mobiles, learn morse code and signal flag trivia. While cruising, kids always put out their radar in search of other kids on boats. Unfortunately, it’s hard to get connected with other kids while underway, especially if your family is traveling somewhere they have never been before. For example, there are some message boards where parents have posted messages looking for playmates along the Intracoastal Waterway. The Seven Seas Cruising Association, www.ssca.org, SailNet, www.sailnet.com , and the Women Aboard bulletin boards are good places to look for and post messages of this sort. Flying a “Kids on Board” burgee that can be clearly read by kids on other boats can also help. Lastly, there is a good resource that parents can read which can help them plan and prepare for having kids on board. 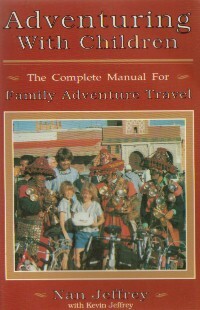 Nan Jeffrey wrote “the complete manual for family adventure travel” in 1990, and the ideas and practical advice still apply today. The Jeffrey family has hiked, sailed, bicycled and canoed on four continents since 1979, and from those experiences came Jeffrey’s book, Adventuring with Children (Avalon House Publishing, ISBN 0-9627562-0-2, www.sailcopress.com ). This book contains lists of supplies, and great tips on activities for kids from infants to teenagers. There are exceptions to some of the age limits that I mention above, as everything depends on the individual child and what types of activities they can handle. Pay attention to their interests and be flexible with your expectations. This article was written with the visiting child in mind: one that does not spend much time on a boat, or doesn’t have much contact with boats at all. If you have invited children to spend time on your boat, you have a great opportunity to make a real impact and create a memorable experience in a child’s life.